Easter is around the corner. Everyone seems to enjoy making the bunny theme bento. Join the crowd! I made a bunny theme bento for this morning. Kids will have their Easter holiday from Thursday and will be back to school on Monday, April 5th. I will fly to Singapore on Thursday with Audrey. Have to do something there and just stay for 1 night only. We will back to Jakarta on Friday afternoon. This will be mom and daughter trip only. Andrew will stay in Jakarta with my husband ;) Today's bunny was made of rice molded by hand and decorated with part of egg white from boiled egg (colored), nori, and crab stick. Inside the box : bunny shapes rice, beef frikadelle, carrot, cucumber, two colors corn, tamagoyaki, cherry tomato, and brussel sprouts with smoked ham. Don't forget to join Debra's BOMB Challenge at Hapa Bento. Debra is great in making her healthy beautiful bento. And she is kind to arrange the BOMB Challenge every month. So I really encourage every bento maker to participate and have fun together. Lia, you really make GREAT bento on every ccasion! Aww, look at the little bunny girls. How sweet ! School kids will have two weeks off over her estarting this weekend and I am also looking forward to my three day weekend. I love your bentos, they always look so adorable. Where do you buy your bento accessories? Online or in Jakarta? I will go back to Jakarta in June so I will be grateful if you can tell me where you buy those cute bento accessories. A few years ago I didn't see so many shops selling bento stuffs in Jakarta. Such sweet bunnies, and lots of nice variety in the other side! Lovely bento for BOMB, Lia! Lia, your bunnies are adorable!!! 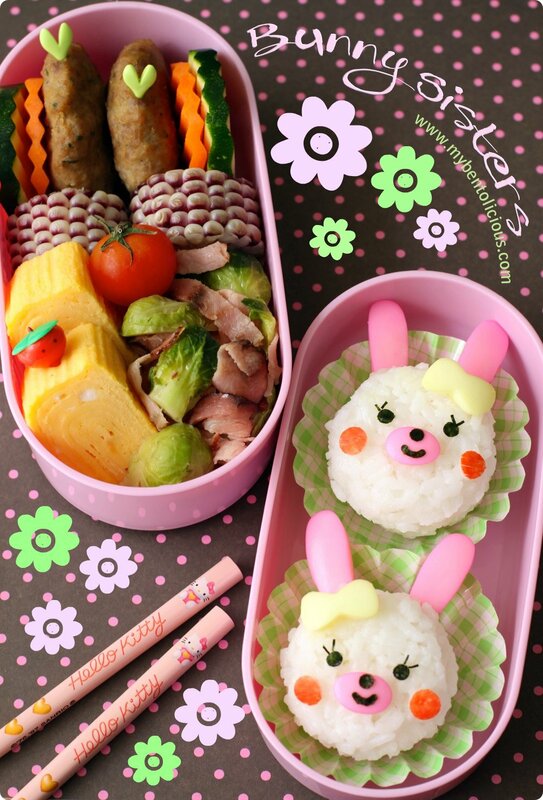 SO cute and the bento looks delicious! The cuteness and clever prop styling are just overwhelmingly great! Thanks again for the sweetness and smiles your original bentos bring to us! Lovely bunnies Lia!!!! And I love the 2 colors corn you have too! I've not seen this type here before. We only have the black one and the one I used to buy, the pearl corn. Oh yeah, enjoy your trip to S'pore! I miss-miss-miss that place!!! @Kids Dream Work : Thanks a bunch Ai Ping! Thanks Lia for supporting The BOMB! You are so sweet. What a great bunny bento! You do so much in one box! I love it! The corn is so visually interesting! Do you cut it small after it's cooked? how it can looks so pretty? Your bunnies are adorable, almost too cute to eat! Of course I would love to get this bento for lunch! Hi Lia, Happy Easter Day! I've an award for you, please come and pick it up when you're free. @Rachel Hei : Thanks a lot Rachel! WOW ... 2 awards? Are those the Easter gift for me hohoho ... :D I feel honored to receive them from you. Hope you enjoyed the short trip.